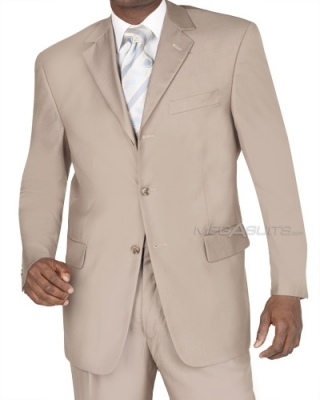 A tan suit can be a great way to add a little variety to your wardrobe. We’ll give you some good tips to make sure you keep things stylish! This color is usually associated with summer, or warm weather in general. If you live In a tropical or mild climate, it can be a great addition for a cooler look. Grey, navy, or black can get hot! Some people use the old Memorial Day to Labor Day or Easter to Labor Day rules for when to wear a light colored setup but those are more rules of thumb than anything. You certainly wouldn’t look out of place in Miami in March with one of these on. As far as material and fabric, go for something lighter. A nice tropical wool can work well. Some other guys like cotton, gabardine, or linen. I’m not as big a fan of those as they can tend to wrinkle and show some sweat. I tend to generate a bit of that myself! This isn’t something you would wear when its cool out so go as light as will comfortably cover you. Matching tan can be a little bit of a challenge. I like a nice basic white shirt, with a pink, or light blue tie. A blue shirt also looks nice. If its hot out, maybe ditch the tie. I know that’s sacrilege for some guys but, if its hot out, or the club is crammed, it can work. This works if you have a one or two button, more casual looking design. If you have a choice of liner colors, go with something light as well. A nice cream or light blue looks good, as well as a lighter tan. Some guys like light green or other pastel but I don’t think you want to be too loud with it. For shoes, basic tan, brown, or chocolate loafers are a good bet.